First Impression: A unique heroine and a dastardly villain stand out in this sweeping Regency romance. What Really Worked: I was quite drawn in by Max and Olivia’s love story. Olivia was a rather unique heroine. She contracted malaria as a child, and she still suffers from terrible fevers because of the disease. She’s convinced that no man would want her as a wife due to her frail body and bouts of illness. Max, however, falls hard for her regardless. The book starts out with a wager between Max and the unpleasant Marquis of Fenwicke. The bet is that Max will not be able to seduce the seemingly “frigid” Olivia. I was a little concerned, because this set up doesn’t exactly grab my attention. The bet is all but forgotten after a few chapters when thing get very interesting. I think what really spiced up this story was the simply dreadful villain, Fenwicke. I won’t reveal his dastardly deeds here. You must discover them for yourself and be as angry at him as I was! What Worked: I really enjoyed the close, protective relationship the four Donovan sisters shared. The first book in this series was Serena Donovan’s story, though I have not read it yet. There were only a couple of times where I felt I was missing something by not having read the first book. Overall, the author did a great job presenting the sisters’ backstory. What Didn’t Work So Much: I kept waiting for Max to turn into the bad boy he claimed was lurking beneath the surface, but it never happened. His greatest fear (and the reason he refused to marry) was that he’d become an abusive monster like his father, but I never saw any evidence of that. That’s not a bad thing. I just wasn’t convinced it was a reason for him to stay a bachelor. Final Thoughts: Enjoyable! 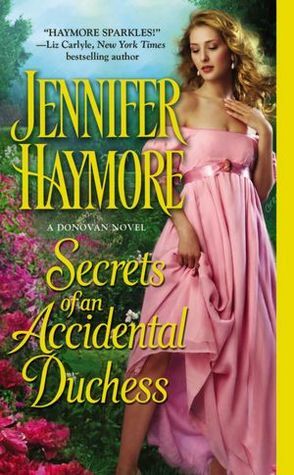 SECRETS OF AN ACCIDENTAL DUCHESS is a captivating read for fans of Regency romances. This entry was posted in Historical Romance, Reviews, Romance and tagged 4 Stars, England, Jennifer Haymore, Regency. Bookmark the permalink.